Entertain a variety of guests with a garden party that features unique hammock chairs that have a variety of prints with bright colors. The chairs in this collection feature green and white stripes with prints ranging from trees to butterflies to insects, flowers and more. Choose a design that features colorful gerbera daisies and spread some cheer at your party. 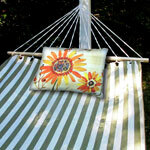 Select a beach-themed design or one that features intricately-crafted sunflowers. No matter the design, the swing hammocks in this collection are sure to have something for everyone. Sway gently in the breeze with this design, which is supported by a 33-inch wooden spreader bar created from strong Chilean pine. 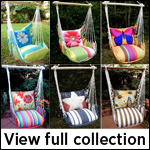 Each swing can support up to 250 pounds hanging from a tree branch, deck or patio. Comfortable polyester material that is machine washable, resists the weather, doesn't fade and avoids mildew make up the cushions of this unique hammock chair. Not only are these chairs fashionable and comfortable, but they're durable too!